Next Wednesday, May 9, 2018, NCBI staff will show you how to use PubChem as a cheminformatics education resource. In addition to learning about tools and services for chemical information search, analysis, and download, you will also see examples of how instructors incorporate PubChem in Cheminformatics OLCC (On-Line Chemistry Courses), an intercollegiate hybrid course. On June 7, 2017, NCBI staff will show you how to use PubChem’s Laboratory Chemical Safety Summary (LCSS) to find the most relevant chemical safety information including flammability, toxicity, exposure limits and symptoms, first aid, handling and clean up. On August 23, Drs. Stephen Bryant and Evan Bolton received the American Chemical Society (ACS) 2016 Herman Skolnik Award for their work in developing, maintaining, and expanding the National Center for Biotechnology Information’s PubChem database of chemical substances and their biological activities. The award was presented at the ACS 252nd National Meeting & Exposition in Philadelphia. Figure 1. Drs. Bryant and Bolton receive the American Chemical Society 2016 Herman Skolnik Award. This blog post is a continuation of last week’s blog on finding biological assay data; it is intended for researchers who use PubChem. Your research focuses on a protein (receptor or enzyme) for which you’d like to identify a chemical probe or modulator. The probe could help to identify the subcellular location of a protein. A modulator may help to determine the biological effects of a particular protein’s activity. Additionally, finding a novel chemical that binds to your protein might assist you in exploring the use of a new class of therapeutics in drug design. At NCBI, the PubChem BioAssay database stores biological activity assay information, which makes it possible to find experimentally measured targets for millions of chemicals. This blog post shows a simple workflow to download a table (with raw and kinetic data) of chemicals that have been determined to bind to a particular gene/protein target. This blog post is directed toward researchers using PubChem. You’ve identified a chemical that you’d like to use in your research as a chemical probe for a receptor or an enzyme inhibitor. However, chemicals are known to be able to bind to multiple protein targets, commonly known as “cross-reactivity”. In biological activity assays, this can cause problems with measuring the activity of a specific protein or pathway. If the chemical is employed as a medicant in living organisms, interactions with molecules other than the intended target can cause “side effects”. At NCBI, the PubChem BioAssay database stores biological activity assay information that makes it possible to find experimentally measured targets for millions of chemicals. This blog post describes a workflow to download a table of gene/protein targets for a particular chemical. Figure 1. 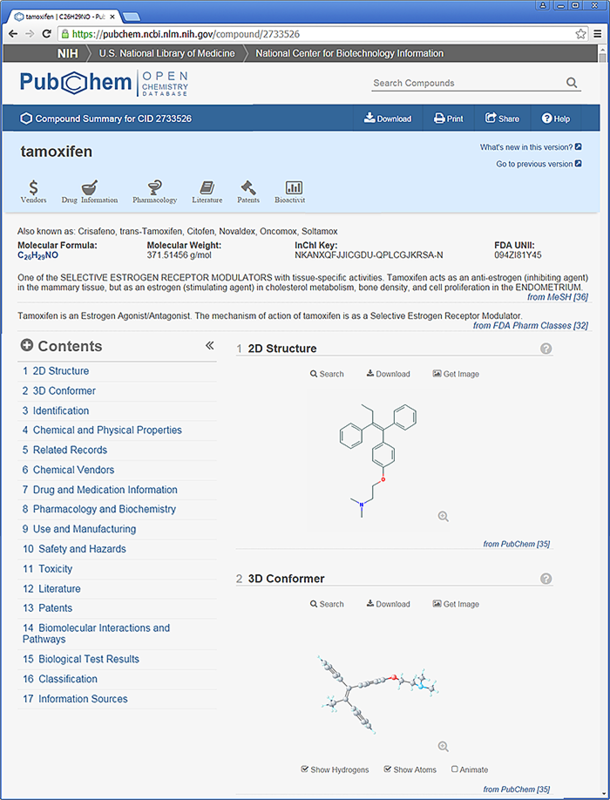 Tamoxifen compound page. On a typical day, researchers download about 30 terabytes of data from NCBI in an effort to make discoveries. NCBI began providing online access to data in the early 1990s, starting with the GenBank database of DNA sequences. Over the years we’ve greatly expanded the types and quantity of data available. You can now find on our site descriptions and data from experimental studies such as next-generation sequencing projects, bioactivity assays for small molecules, microarray datasets and genome-wide association studies. The White House recently recognized these efforts by awarding NCBI Director David J. Lipman with the “Open Science” Champion of Change Award . The scientific community has recognized the benefits of open data. Access to this information serves as a source of both original and supplemental data for exploration and validation [2-4], which improves the power of experimental data  while increasing the speed and decreasing the cost of discovery . In this post, we summarize three recent cases where researchers used data from an NCBI resource/database to make significant discoveries.